Tim's appear to have gone for the 'all things for everyone' approach to packaging design. They have maintained their traditional red and white stripes, they have also included their similarly traditional mountain graphic. There is also a modern graphic of a Jalapeno Pepper - They had better be hot! Overall, the effect seems to mix modern with classic along with mundane fonts not very well. We do however like the flavor color coding. The thickness of these Chips aided there texture rich crunch. The little oil infused bubbles on the surface of the Chips cracked and popped as they were bitten into. The robust and rigid potato slices battled against crumbling. A Nose Plunge Test revealed a fairly bright and breezy Jalapeno aroma. This was matched by the taste. 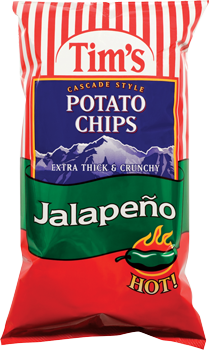 As Chips flavors go it always surprises us that Jalapeno isn't mixed with something sweet; maybe Mixed peppers, or even cheese. These Chips were hot like Jalapeno, which is what it said they would be on the bag. That is however it - I suppose there was the potato to go with it, but despite a mild to hot fire burning away in your mouth, they just seemed to lack a more rewarding and tasty experience.